Howl at the Sky | "Northern Crossings"
We were graced with some more of the left’s performance art view of life as anti-Trump protesters gathered in locales such as New York City’s Washington Square Park for an event urging attendees to “scream helplessly at the sky.” It was interesting and annoying and proved that what many of us believe is probably true, that these folks are pagans. 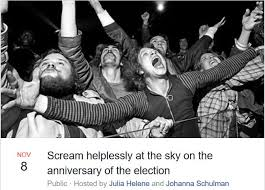 Standing around in various spots in the country and howling at the sky at all the perceived injustices might be a fun diversion for an evening but to paraphrase my mother, ‘if you want to scream and howl, I’ll give you something to scream and howl about”. There are interesting picture of folks howling and screaming at the sky that come to us at this time of the church year. When Christ appears at the end of the age and the great crack appears in the sky there will be howling and every eye shall see him that they have pierced. The coming judgment produces howls and screams and moans and even cursing. There are images of God’s judgment by enemy armies in the Old Testament that picture the enemy growling over the prey and howling in the spoils. Someday when folks are howling at the sky out of fear, Christ folks look up and – praise.